The risk that New Orleans faced from a hurricane was front page news when I lived there 2 years before Hurricane Katrina caused the enactment of all that had been forewarned. It should be no surprise then, that the New Orleans Audubon Zoo staff had a plan. 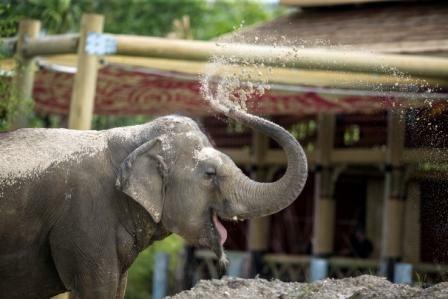 They had deliberately reinforced the animal enclosures to withstand flood waters and had been stocking food for staff and animals in case of just such a disaster. In the event, the staff stayed – taking refuge in the reptile house - because the animals couldn’t leave. When eventually the staff had to leave, New Orleans Police were given rapid training in penguin feeding and carried on for them. Sadly the life giving oxygenation system for the wonderful aquarium stopped – and over 6000 marine creatures were added to the Hurricane Katrina loss of life. Some of the survivors included Midas the green sea turtle (five of his companion turtles were released into the Gulf of Mexico), sea otters, penguins, sea dragons and fortunately, also some fish. Along with land-bound survivors, they went off to 'foster zoos' until once again the Audubon Zoo could reclaim them to their newly restored environment. Due to the zoo’s forward planning, of the 1,400 Audubon Zoo animals, only a racoon and 2 otters perished. 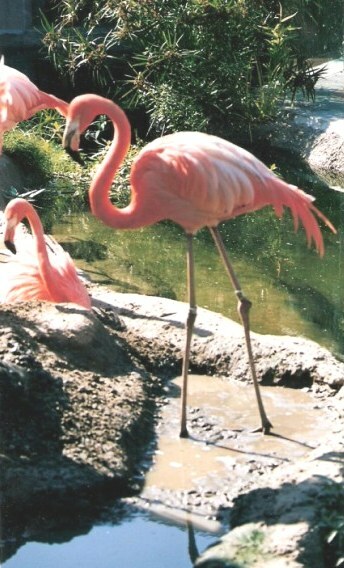 The activities of Audubon Zoo demonstrate unique disaster response resilience. Following the 'Deepwater Horizon' oil spill in 2010 Audubon worked with other institutes and agencies to create a kind of sea turtle triage facility at the Audubon Aquatic Center on the Survival Center campus, where they cared for several hundred turtles injured in the spill. Audubon Zoo lies within oak-tree-lined 340 acre (almost 138 hectares) Audubon Park, which travels down to the Mississippi River from St. Charles Avenue, along which runs the celebrated St. Charles Streetcar -or tram. Audubon Park, is named after the famous ornithologist, naturalist and painter, John James Audubon, was a New Orleans resident from 1812. His Audubon's Birds of North America: The Complete 500 Paintings is still a sought after reference and acclaimed as a great catalog and legacy of accurate bird observation. 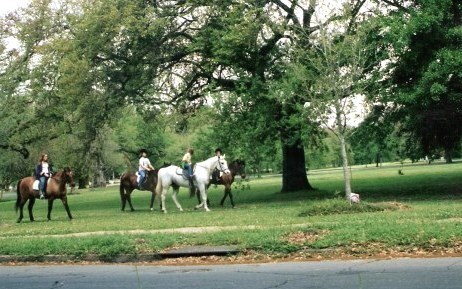 Audubon Park is just a few minutes from the city centre, flanked by both Loyola and Tulane Universities. It has rightly been called an urban oasis. Within it, the Cascade Stables give riding lessons from age 4 onwards, or you can just stable your horse there and ride through the park with your friends. Audubon Park also has a swimming pool; 10 tennis courts in action from 8am onwards; 1.8 miles (almost 3 km) of jogging trails; 3 playgrounds, and a swing set – plus 12 picnic shelters of varying sizes, three of which can be booked in advance – with one of these having an integrated bandstand. Audubon Park has a long history. It was formerly the home of native Americans, then a sugar plantation owned by the 1st Mayor of New Orleans, Etienne de Boré. Boré is reputed to have invented the processes to granulate sugar. 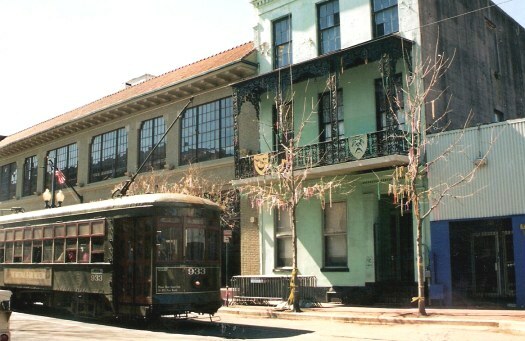 The park has also been a Confederate Camp, Union Hospital, and the site of the World’s Fair of 1884 when New Orleans housed the Cotton Exchange, and was the centre of US cotton production. At the close of the Fair there were some monkeys and rare birds left behind – and this was the basis on which the Audubon Zoo was founded. The excellent Golf Course in Audubon Park has Tif Eagle Greens: it is 62 par, around four lagoons. The Audubon Golf Course was designed by Denis Griffith, who graduated in Landscape Architecture from Iowa State University, is a former President of the American Society of Golf Course Architects, and has the distinction of being the only American landscape architect to complete designs for that cradle of golf, the legendary St. Andrews, in Scotland. Denis Griffith is also a passionate advocate of creating excellent golf courses for public access – and is a fitting architect for this city of the arts, for as he says, his work lets him paint a picture with the landscape for people to enjoy in perpetuity. He says this course beside the Audubon Zoo was a special achievement. This is a zoo with delight for all ages, with its cooling sprays guarded by giraffe. 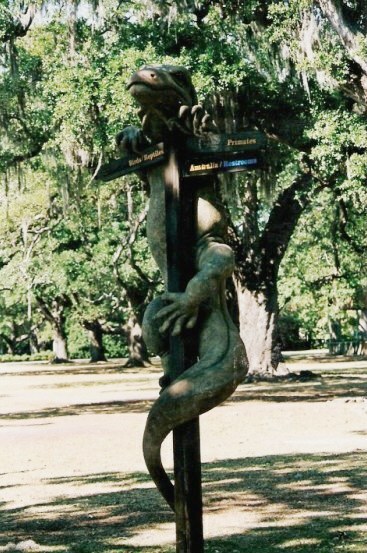 There are marvellously fanciful sign posts like this one hugged by the giant Komodo Dragon. There is one in residence in real life – the largest of the lizards - up to 2.7 metres long (9 feet) and weighing up to 90.7 kilos (200 lbs). He would be able to outrun most humans because he travels at speeds of up to 24.14 kph (15 miles per hour). There are playful pachyderms. When I was there the Asian elephants Panya and Jean were much loved entertainers, sparying themselves - and sometimes you as well. Jothi and Surapa became room mates with the two long-term residents in November 2018 and no doubt were rather pleased about the more tropical conditions of the $10 million quarters, with heated barn floors, lots of shade, and room to wander about and not get in each other's way. Dear old Panya died in March 2019 after sudden onset of delibitaing kidney problems. 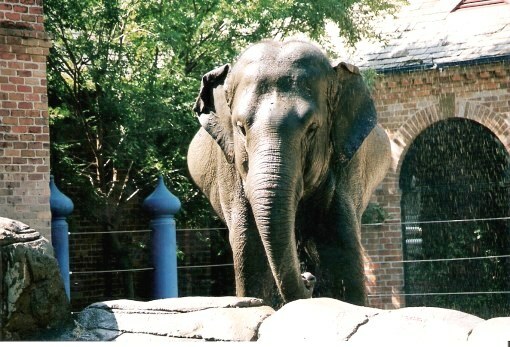 Panya was 54, and as any years over 50 are considered a bous for an elephant, we can believe that she had a good innings in the care of her friends at Audubon Zoo. Many staff members had worked with Panya over periods of longer than 20 years and both loved her and respected her forceful and intelligent personality. 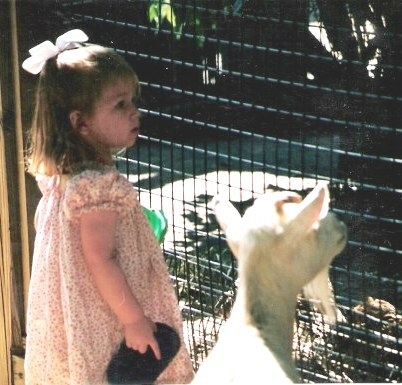 She is much mourned by those who loved to visit Audbon Zoo, and by all her friends and staff. Before anyone could predict the sudden impact on the health of Panya, arrangements had already been made with Buffalo Zoo to relocate their two middle aged elephants to join those already in residence. Say goodbye to her with this moving video. 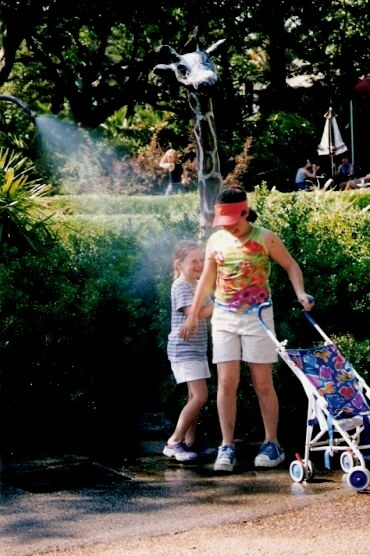 Being carefully cared for, the grounds of Audubon Zoo are home to many accidental residents. 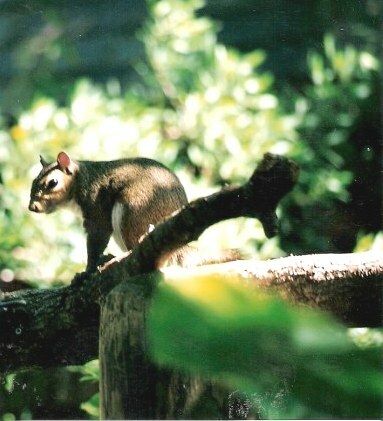 For example I saw small, curious eyes peep through the treetops and, with a whisk of the tail, the squirrel was gone. Since Audubon Zoo is named for the great ornithologist, naturally there are many species of bird who make it their home. 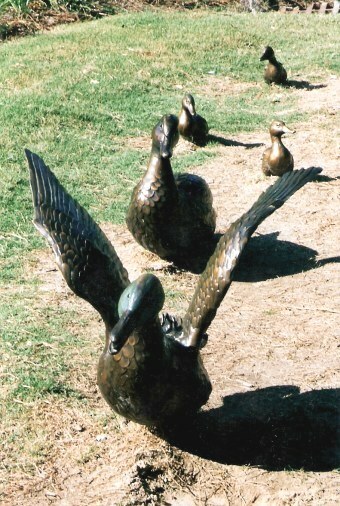 There are ducks real - and bronzed. It always delighted me to arrive at this wonderful pond of pink. Flamingos crowd around a small pool of water, bright against the reflected New Orleans blue skies of summer. 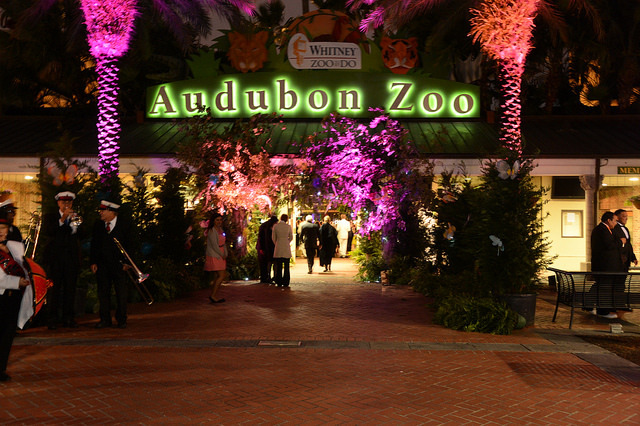 There are special events being held at Audubon Zoo regularly. I remember Jazz at the Zoo being a really lovely evening out. Now, there is the fantastic gourmet Audubon Supper Club. You can book for the Supper Club here. In February there is the annual Gospel Showcase called 'Get Yah Praise on'. In March there is the annual 'Soul Fest' celebration of African-American cultural celebration. At Halloween there is 'Boo at the Zoo' and in December, celebrate with Audubon Zoo lights. Spend time with the primates and celebrate the birthdays of baby Sumatran Orangutans born in 2009. This threatened species could be extinct in less than 15 years without intervention and breeding in captivity. Check out the different flipper waves of individual sea lions; visit the jaguars, spider monkey and that wonderful, almost cartoon character – the sloth – in the recreated Mayan jungles. Wonder at the rare white rhino – whose rapidly decreasing numbers in the wild are being supplemented by breeding in captivity – slowly, as Mrs. Rhino has a 17 month-long pregnancy. Play on, and roll down, Monkey Hill. On Friday May 3rd 2019 don't miss this grand event in New Orleans. It is the 42nd Annual Fund Raising event called Whitney 'Zoo to Do'. And it is a real 'To Do'! 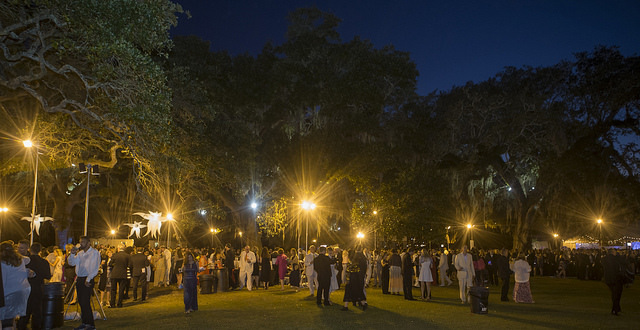 Dress up in your finest, eat gourmet food donated by the many great restaurants of New Orleans, and make sure you save your specially branded drinkware to recreate memories of great live performances, great food and great comraderie, New Orleans style. Monkey Hill is a legacy of the Works Progress Administration – later to be re-badged as the Work Projects Administration or WPA, by whose initials the programme is generally remembered. During the Great Depression, the Roosevelt Government developed a range of programmes to put unemployed people to work under The New Deal - and they became known by their acronyms, or initials – leading to a general branding of them collectively: Alphabet Soup. Some of these programmes remain, and some have been incorporated into others – but they made a huge impact on an otherwise hopeless section of the unemployed population. Over the hard eight year period of existence, the WPA provided work for over 3 million unskilled people (mostly men). 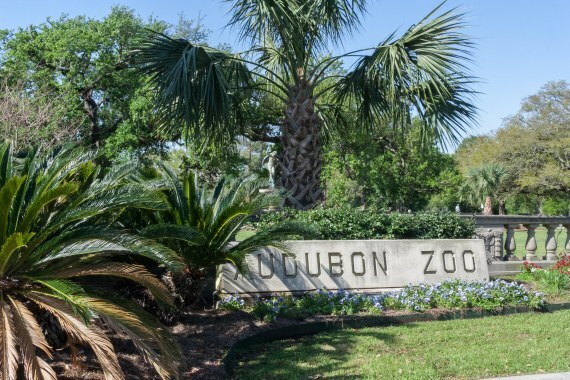 Most American cities have a legacy of Public Works that comes from the labours of the WPA – and New Orleans has Monkey Hill at the Audubon Zoo. Urban myth has it that it was created so the children of New Orleans would know what a hill looked like! According to folklore, the 8.5 metre (28 feet) of Monkey Hill creates the tallest point in New Orleans (disputed by another hill in City Park). Whatever its competitive status, it is always fun to roll down it! 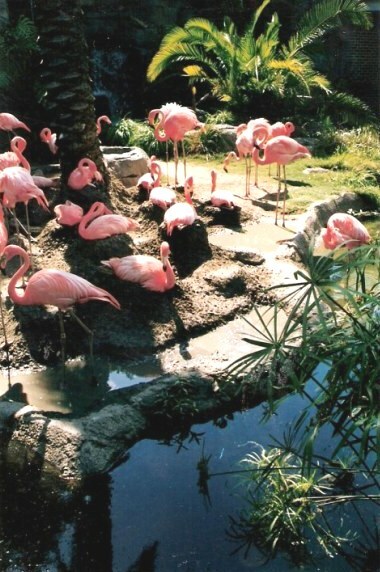 Audubon Zoo is a much-loved destination for small adventurers. It has its own five-level tree-house, rope and net bridges, and a wading pool. There is even a special Zoo-to-Do for Kids. Mark your calendar: Friday April 26th, 2019. A great day for kids of every age as you can see here with this video. But what makes Audubon Zoo truly magical is the response of its younger visitors. 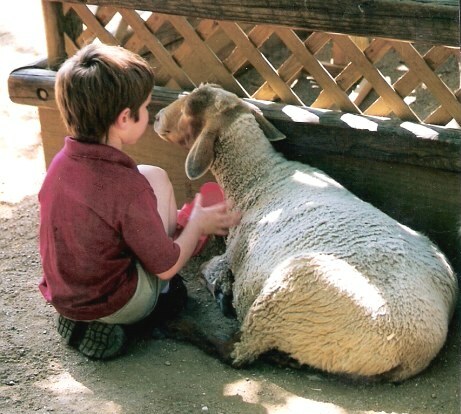 They get the chance to make new friends with whom to look at the rest of the animals. Wonder is the voiceless music in the heart. In New Orleans, the music city, you can see this voiceless heart music everywhere at the Audubon Zoo.